Vitamin D is a very important vitamin. It is formed mainly in the skin and then used by every cell in the body. Low levels of vitamin D in children and adults have been linked to the development of many illnesses. A normal level of vitamin D is needed to absorb calcium from food. Calcium is vital in building strong bones and teeth and is important for the nervous system. Correct levels of vitamin D are important for the immune system to work properly. How does my body get vitamin D? Ninety per cent of vitamin D is made from sunlight exposure directly on to the skin (not through glass). Only about 10 per cent of vitamin D comes from food sources such as oily fish, fortified milk and egg yolks. How will I know if I have low vitamin D? Your doctor can order a blood test. What if I wear clothing that covers most of my body for cultural/ religious reasons? This often makes it hard to get enough sun to make vitamin D. It is therefore recommended that you take extra vitamin D in the form of a supplement; this will benefit both you and your baby. What are the main long-term effects of not having enough vitamin D? People who are vitamin D deficient are at risk of having softer bones that are prone to breaking. Muscles can be weak and sore in severe deficiency. Vitamin D deficiency may also be a risk factor for pregnancy related conditions including pre-eclampsia, hypertension, cardiovascular diseases and pre-term labour. 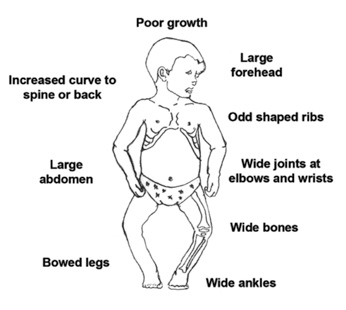 Children with very low vitamin D levels can develop rickets. This can be serious. Because the bones don’t form normally the child can be short and the legs bowed. Sometimes the calcium level in the blood can be very low and this can lead to the child having seizures (fits).